Our partner Google needs this information. It is necessary to fully optimize the monetization of your website. Enter the URL of your reference in order for them to receive 15$ ! Display & Banner Advertising: We Will Find the Perfect Ad Unit for Your Website. They are essential in the process of audience monetization. Also known as the “leaderboard”, this banner of 728x90 is a simple but efficient ad unit. It can be on the top or bottom. Mobile & desktop friendly. Also known as the “MPU”, this 300x250 ad unit is as essential and very efficient. It can be placed on the top or bottom of the webpage. Mobile & desktop friendly. Also known as the “Double MPU,” its a 300x600 ad unit. Part of the new IAB Rising Star selection and very popular with premium advertisers due to its high impact but uniform size. Mobile & desktop friendly. One of the first known digital ad units utilized, it contains 120x600 and is placed on the right-hand side of your content. Mobile & desktop friendly. This 300x250 pixel ad unit is part of the MPU family. It’s placed on the bottom right hand side of your page. Mobile & desktop friendly. Slightly larger than the standard Skyscraper but not as commonly used. With this 728x90 pixels just like the standard Leaderboard format is placed at the bottom of your website. Mobile & desktop friendly. A « widescreen » ad unit increasingly used by advertisers. It’s placed at the top of your page. It is 970x250. Mobile & desktop friendly. is here to select the most efficient among them. One of our most lucrative ad units ever, our popular skin format literally frames your website with a dazzling ad message. Mobile & desktop friendly. Innovative, non-intrusive and easy to install. This innovative and easy to install unit automatically places itself on the bottom of your screen without covering content. Mobile & desktop friendly. Situated conveniently below your content, this format links to similar articles on other websites or advertiser pages. Mobile & desktop friendly. One of the most requested ad units for good reason, the native ads insert themselves automatically, either below or within your content. Mobile & desktop friendly. Video is the most lucrative form of advertisement. In this format, the video advertising content is not user initiated and only starts when the format comes on the screen. It is strategically placed between two paragraphs. Mobile & desktop friendly. An advert which is played before the video that has been selected for viewing. Mobile & desktop friendly. The number of impressions = the number of view pages ? Many publishers make the direct connection between the number of view pages (that they can see on Google Analytics for example) and the number of ad impressions. Unfortunately, it isn’t that simple. Indeed, if you place a unique ad unit on all your pages, you could be tempted to deduce that 1000 view pages = 1000 ad impressions (displayed ads) but it is not. Even with a CPM system, the number of view pages is very rarely equal to the number of ad impressions. 1- The ad blocking: a certain percentage of your visitors use ad-blocking software that prevents ads from appearing on your website. Unfortunately, these visitors do not make you earn money because they do not see any ad. 2- The browsing habits of your visitors: if a surfer is used to browsing your website, it is possible that he goes from one page to another very quickly because he knows where to find information/content he wants. The ad won’t have time to load and the ad impression won’t be recorded. 3- The advertising visibility: A non-visible advertising is not interesting for the advertisers and will consequently have very bad performances (click rate, visibility rate, etc.). It is counterproductive to place advertising units in your footer if your visitors never scroll to the bottom of your page. Be careful, this does not mean that you have to forget the "low" ad units. A top medium rectangle can be a very good source of income if it is placed in the middle of your side bar and your content forces the user to go there on the page. The Moneytizer uses the CPM calculation to remunerate his publishers. Despite the barriers to monetization that we have just mentioned, your traffic and the number of ad impressions are closely linked. The more visitors you have on your website, the higher your revenues are. You just have to create qualitative contents. What criteria determine the value of the CPM on my website? - Your audience. Some audiences have a lot more value than others from the advertisers point of view. Example: If your website is mainly used by people with low purchasing power, the value of each visitor is also low. On the opposite, if your website / blog attracts users with a high purchasing power, the CPM will be higher. - The performance of the ads on your pages. Even on a CPM payment basis advertisers’ bids will be higher if your ad units have a good click-through rate or if they often lead to purchases. Hence the importance of properly placing your ad units so that they are visible. - The seasonality. The header bidding algorithm developed by The Moneytizer places thousands of advertisers into a bidding competition for your ad spaces. The value of the CPM therefore depends on the cost they are willing to pay to display ad on your website. Before Christmas, for example, the quantity of advertising campaigns inflates CPMs due to overall demand increase. I am self-entrepreneur, how is billing done? As a self-entrepreneur, your DUNS number must be filled in your personal space The Moneybox – page “PROFILE”. According to the article 293B of the General Tax Code, the VAT is not applicable to self-entrepreneurs. The final amount of your bill is therefore excluding taxes. I am a European foreign company and I do not have VAT on my bill(s), why? The VAT differs according to European countries. This is why your automatically edited bills are excluding taxes. If you are a company, you will have to declare them to your customs service according to the conditions of your country. What are the criteria to get my referral benefits? Where can I see my detailed statistics (impression, eCPM)? From the “home” of your personal space The Moneybox, you just have to click on “download my stats” in order to obtain a detailed CVS file. 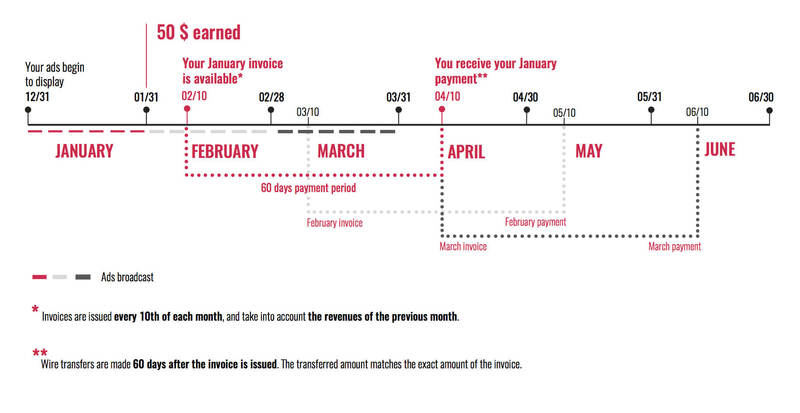 As soon as you have reached 100 euros of earnings, an invoice is sent on the 10th of the month. Payment will be made automatically by bank transfer or PayPal 60 days after the billing invoice. You do not need to ask for payment, everything is automatic. Why does it take so long to get paid? We would like to pay you sooner but this is the rate in which our partners pay us.